Courtney Baker-Richardson, seen here scoring a dramatic extra-time winner against Hitchin, has opted to remain at Leamington. Leamington boss Paul Holleran believes Courtney Baker-Richardson will not have to wait long to fulfil his dream of full-time football despite having committed himself to Brakes for the 2017/18 season. However, despite interest from a number of clubs, Baker-Richardson has opted to remain at the Phillips 66 Community Stadium and Holleran believes the decision will benefit the 21-year-old in the long run. “There was some interest but not from the clubs he wanted,” said Holleran. 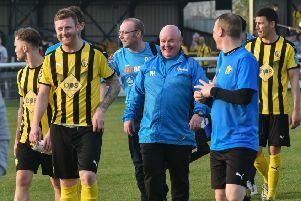 “To be fair to Courtney he was offered a couple of better deals but he felt while he was in part-time football it would be better for him to stay at Leamington. “In his time here he’s improved on and off the pitch and if he keeps progressing he’ll get to where he wants to be in the end. Baker-Richardson was released by Coventry at 18 after being handed his debut by former manager Steven Pressley against Hartlepool and spent time at Ilkeston, Romulus, Kettering and Redditch before finding his feet at Brakes. Twenty goals in 55 appearances, including the dramatic play-off final winner against Hitchin, have justifed Leamington’s faith in him and after an unsettling period for the Coventry-born forward, Holleran says the player is benefiting from a more mature outlook. “He turned up at Leamington having had five or six clubs in a short space of time and he was like a lot of young lads struggling to adapt after coming out of the pro game. “They have been living in a bubble and don’t have a lot of life skills and people skills. “Courtney was an example of that but there was something I liked about him and made it worth going that extra mile. “He did ever so well for us last season. He’s bigger, stronger, more mature and he’s developing into a decent young man. “What Courtney did last year proved that he was a good Step 3 player. “He’s adaptable and chipped in with his fair share of goals.